Every wedding story has a wedding dress story and I have been waiting to share this one with you all! Time to tell you all the tale of how I said “Yes” to my dress, well winning it! My story starts back in 2007 when I took a trip to San Francisco with my show choir for a competition. In between seeing the city and singing and dancing our hearts out, we took part in some retail therapy. I was determined to get my prom dress for that senior year and San Fran was going to be the place. I found Jessica McClintock’s altier and knew that was the place! The dress I fell in love with was long, white, classic and clean. I was obsessed with it and wore it that year to the prom! Because of my infatuation and the price, and possibly the style, my family joked it would be my wedding dress someday. But the running joke turned into reality. First off let me say how beautiful the dress is! Now let me share my story. I got engaged December of last year to the love of my life. And I truly agree with you on having the “one” be the most supportive. He proposed to me after his grandparents 50th wedding anniversary on the beach of Puerto Rico where half his fam is from. His other half is Native American and we met in Arizona. We are entrepreneurs who have a passion for making each other better. We bought a house in April and are planning a wedding all in the same year. Our house needs renovations and I have never been the dream planner so a wedding budget is non existent. We’re spending $8K on a block wall because we’re getting married in our backyard. With all this said there’s no budget for a dress. I joked in Highschool my expensive prom dress would be my white wedding gown and here I am 12 years later actually considering wearing it. I have never been the type of girl who had her dream wedding planned out in fact, I am happy going to a court house because it’s the union that matters, but seeing your face in “the dress” I mean there’s a show called “say yes” because it has to bring a magical moment to any bride! And it’s a magical moment I would feel honored to feel and share with the love of my life forever. On 10/12/19 I will marry the love of my life Jose Acevedo the backyard of our historic home in midtown Phoenix rain or shine prom dress or dream. A few days later, in line at a drive thru, I yelled “I won!” Like the old man in the end of Vegas Vacation who pretends to die, “I won, the money is mine!” I was so excited. When I picked up the dress that week from the station tears were flowing. You can see that reaction here. I immediately went home and tried it on. No moms, no maid of honor, no one, just me, and I cried tears of joy because I felt that same feeling all the girls on that show do. It does truly exist. You can see from my self timing photos bellow, I wanted to capture this first moment. Months later, I tried it on again with my soon to be mother in law and actually buttoned it all the way up! Aside from the donuts I need to say no to and the squats I need to add to my routine, it fits great, but every bride will say she has a few LBs to lose, myself included. 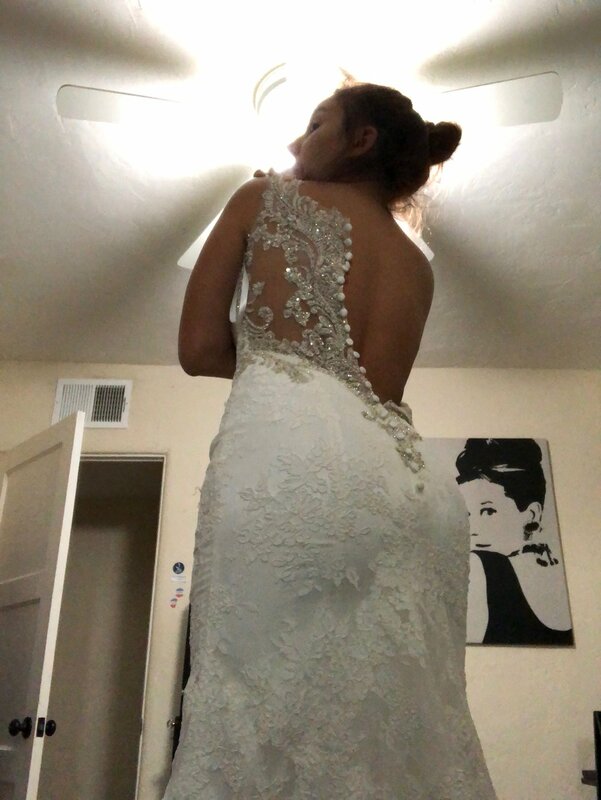 I can’t wait to actually get some stunning photos in this dress and knock the socks off my husband to be when he sees me coming down the aisle in this beauty. Now that I am in tears again sharing this story I hope it heart a heart string to you that things will always work out if you put out what you want back.